Near-field scanning optical microscopy was used in collection mode to examine the optical field distribution on the surface of tilted fiber Bragg gratings (TFBGs) coated with a layer of randomly spaced silver nanocubes. The nanocubes disturb the periodic pattern of the near field visible light distribution arising from counterpropagating cladding modes excited by the TFBG. Spots with more than two orders of magnitude enhancement of the near field light intensity were observed around the nanocubes, as well as an average enhancement over the whole surface of about an order of magnitude relative to uncoated fibers. 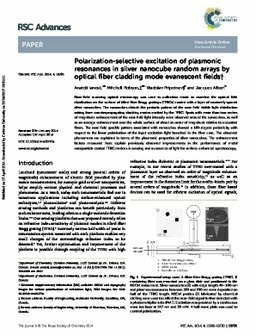 The near field speckle pattern associated with nanocubes showed a 180-degree periodicity with respect to the linear polarization of the input excitation light launched in the fiber core. The observed phenomena are explained in terms of the plasmonic properties of silver nanocubes. The enhancement factors measured here explain previously observed improvements in the performance of metal nanoparticle coated TFBG devices in sensing and as sources of light for surface-enhanced spectroscopy.